Looking for a delicious and healthy dessert that the whole family can enjoy? 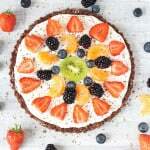 Try my gluten free, no bake Chocolate Fruit Pizza! First up make the base by blitzing the almonds in a food processor until they have broken down into a fine consistency, almost like almond flour. Add the dates, melted coconut oil, cocoa powder and vanilla extract and continue to blitz until the dates have been finely chopped and everything is well combined. Press the mixture into a springform tin or tart dish and place in the fridge for an hour to set. If you don’t have much time then you can put it in the freezer for 15 – 20 minutes. Make the filling by mixing the cream cheese, greek yogurt, orange juice and zest and vanilla extract together in a bowl. Now spread this mixture onto the top of the pizza base and then decorate with the fruit topping of your choice. Serve immediately or store in the fridge for a couple of hours until you are ready to eat it!